I started practicing karate when I was a teenager, and soon after, I began to notice a phenomenon that now seems, to me, ordinary. A new person would come to the dōjō, love it, and declare that he was going to dedicate his life to the martial arts. And then he’d disappear. It seemed, in many cases, that a person’s longevity was inversely proportionate to his or her enthusiasm. I understood that not everyone follows through on everything, but the predictability of this always seemed strange. By the time I started to see this in the Zen world, it just seemed sad and familiar. During my time in Alaska, two young people came and spoke with me very seriously about the prospect of ordaining as a priest. They had never come to sit with the AZC; in fact, they’d never sat anywhere, with anyone, ever. In both cases, I suggested that before they change their names, put on robes, and enter a monastery, perhaps they should just come and sit with us, but the response was that they wanted the “real thing,” not this sit-in-the-morning-in-someone’s-living-room, play-acting version of Zen. I encouraged them to come; they didn’t come. That was the end of it. Another young man wanted to travel with me to Japan one summer to train at a monastery, but he didn’t want to come sit with the AZC there in his own town. He told me without any irony how serious he was, how committed. It’s easy, after a string of these encounters, to just dismiss someone like this, but I do believe that as he made his case to me, he did feel that serious — he did believe that he was that committed, even though he had no idea either of what he was asking for or what he was rejecting. He was, in his way, sincere. I suspect that this same scene is played out at Zen centers around the world, all the time. In Anchorage, someone would come and sit for the first time and stay talking with me in the doorway for half an hour afterwards, thanking me and saying she’s finally found her true home. And I’d never see her again. It’s recognizable even mid-conversation — you feel, with some certainty, that this exuberant hello is really goodbye. Since I started this blog, a couple of people have written to ask for help in getting into a monastery in Japan. These are people with no teacher and no experience, just an idea that they know exactly what they need to do: become a Zen monk and train in Japan. I asked if they could sit with a local group, maybe cultivate a relationship with the guiding teacher there. In both cases, there was a nearby group, but in both cases, attending was out of the question. They wanted the “real thing.” Sitting with a bunch of ordinary people in jeans and t-shirts is fine for some, but not if you really want to solve the great matter of life and death. I struggle sometimes to understand what this is all about, and how best to address it. Some people are just flaky, or flighty. That’s true anywhere. Most have created a narrative about the practice, or themselves, or both. 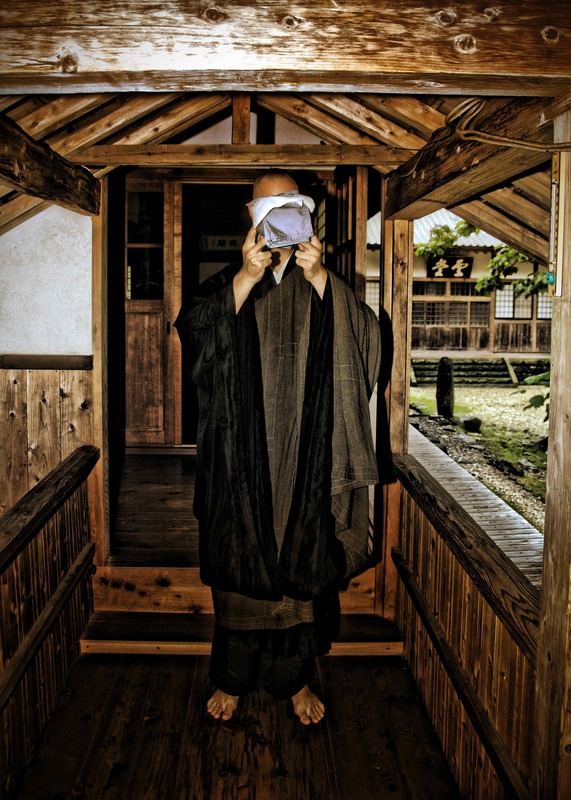 If it’s the practice, it’s often connected to the idea that it’s all or nothing, that one either ordains and trains like Dōgen or stays home (unfortunately, this often brings with it the idea that the people actually attending the Zen center are fooling themselves); if it’s about themselves, then perhaps it’s that they see, in that first encounter with Zen, a vehicle for becoming the person they want to be, disciplined and compassionate and wise, and special. Both of those narratives are mistaken. If we want to say that Zen is all or nothing, that’s not wrong, but “all” doesn’t mean what we think it does (nor does “nothing,” for that matter). However, we can just as easily say that it’s neither all nor nothing, that it’s just this. It just is what it is. If it’s sitting once a week on Sundays, that’s what it is; if it’s sitting six hours a day in robes in a 600-year-old building, then it’s that too. What it isn’t, in any case, is the version of it that you can’t have right now. And as for Zen making us who we want to be, that just isn’t the case. It doesn’t even do the Hallmark-card reverse: making us want to be who we are. Zen is about letting go of who we are. It’s radically not special. Along the way, as we navigate what that all means, it can even be a little depressing. In short, hosshin is important. But by definition, when that mind is first aroused, it will bring with it all sorts of delusions and misunderstandings and immature views of what it all means. Someone looking at Zen from the perspective of hosshin cannot know what the practice really is, nor can they even begin to guess what it might produce. It’s just this feeling, this recognition. It’s what gets us through the door. Without it, nothing happens. So when we see it, we see something precious, something to be nurtured and encouraged and supported, like a child. But often it also brings with it a childish view, one that is impatient and self-centered and unforgiving. I feel a lot of love for these young (they’re usually young) people who come to the practice as if they’re on fire. I was like that — every wrong idea I’ve ever heard about the practice is one that I’ve had myself. When I was about twenty, I wrote a long letter to a teacher I’d met (a student of Thich Nhat Hanh’s) announcing that I recognized her as my true teacher, that I wished to formally be her student and dedicate myself wholly to her teachings and to the Dharma. She was the only teacher I’d ever met, but I just knew. It wasn’t that I knew about her, though I respected her deeply — it was that I felt, in my bones, that there had to be more to the practice than what I was doing, and that I had to be special for knowing that. I told her I was awaiting her orders, ready to jump and do whatever she needed me to do. I was ready. She never wrote back. I waited and waited, but that letter didn’t come. When I think of it now, I’m embarrassed for what I wrote — not for the feeling behind it, but because I sense that she saw, in that letter, what I have come to recognize in people who appear from nowhere and say they want to move to Japan and train in a monastery. I was that guy. But I also feel grateful. She wasn’t my true teacher. I wasn’t her true student. Her silence — whatever her reasons — freed me to find my way to where I am today, to my teachers, to this tradition. Mostly, when I think of that letter, I feel unsure about skillful means. That teacher saw a choice to either feed my intention or starve my delusion — she chose to starve the delusion, and from where I stand, that was exactly the right thing to do. And yet, and yet– When someone comes to me with great delusional dreams of jumping in head first, bald and bigger than life and engulfed in flames, of course I see the delusion, but my heart wants to feed the intention, to try to find a way to the mind that just now recognized, for the first time, something so huge and doesn’t know what to do with it, or even what it is. When I talk with other teachers about ordained disciples, they’ll sometimes talk about the one or two that “got away” as if completely losing at least a few people in that way is a foregone conclusion, a predictable outcome. There’s an assumption that sometimes, despite our best efforts, the balance just won’t be right. I, for one, have not figured it out. How to applaud with one hand while wielding a sword in the other? I don’t know. A French translation of this post can be found here. When I was a pimply-faced high school kid, I used to go to a dermatologist I’ll call Dr. Selmer. I disliked him intensely. He was always strongly recommending acne remedies that had, in his own words, “basically the same side effects as chemotherapy.” That seemed insane, even sinister. I never did this to his face, but my way of showing my family how little I respected this man was by refusing to refer to him as a doctor — I called him “Mr. Selmer.” I remember seeing how much power that had, how wrong it sounded, how it made my parents cringe just a little every time. Titles, at least in Soto Zen, are tricky. When other priests in Japan send me correspondence, they usually append shūshi (宗師, “religious teacher”) to my name; occasionally, they’ll even write rōshi (老師, “old teacher”) — no one uses the term to my face (I’m 39! ), but in writing, those kinds of exaggerated honorific titles are just a way of showing respect. It doesn’t mean much. Most people here call me Koun-san, with the san meaning absolutely nothing, but people who know something about Zen might call me oshō-san (和尚, harmony + esteem, often translated as “preceptor”), or maybe Koun-oshō-san (if you hear ossan, that’s just oshō-san getting contracted, usually to convey something a little bit casual). Our neighbors have taken to calling me sensei recently. Sensei is most often translated as “teacher,” but that doesn’t do it justice — it’s used for teachers, but also for doctors, or for the school nurse, or for artists of a particular standing, or for older musicians, and on and on. Sensei is what you call someone when you recognize that their standing or category probably merits its own term, but you don’t know what that term is. It’s handy that way. Literally it just means “one who is ahead,” so it’s a recognition that a person clearly has something to offer. It’s very possible that the neighbors call me sensei because my wife is a university professor, and it’s just more comfortable to give us the same status. All these titles (and there are many more) share one thing in common: they are never, never used by the person in question. That is, the neighbor can call me Koun-sensei, but I cannot call myself Koun-sensei. Even just to say that I’m a teacher, I have to use a neutral term like kyōshi (教師) — sensei is a term of respect, and here, culturally, it’s understood that one does not do that when referring to oneself. Ever. So it’s always jarring for me to see Western teachers sign their email with “Roshi” or “Sensei.” The practice is not universal — in fact, the majority of priests in the US don’t do this (a high percentage don’t even use their Dharma names). But nor is it uncommon. I see it all the time. And what I’m mostly seeing is correspondence among colleagues, where, regardless of one’s vocation, it might be a little strange to refer to oneself by title, given that most of your colleagues are basically the same rank. I suspect the self-use of honorific titles is much more common when priests are dealing with laypeople. I realize that for many priests and centers, it’s probably too late to be addressing this; I also know I’m hardly the first to bring it up. But still, I’d like to appeal to those who don’t use these titles publicly, especially young priests at the start of their careers, to not go down that road. I can’t see the benefit of it. There is no such graduation moment for a Soto priest. If you live long enough, and if the people around you feel either respect or affection for you, you might find one day that you are a rōshi. That’s all. Maybe it will never happen. It’s not really something to aspire to, largely because it doesn’t mean the same thing to everyone involved. One priest in his sixties told me that the first time he was called rōshi in a conversation, his response was to go to the washroom and look in the mirror to see if he’d suddenly aged. Many priests are never called rōshi, regardless of how long they live. (There is one exception to this, which is that the central monastic office titles of dōchō, seidō, godō, and tantō often, as a custom, get rōshi appended to them, but even that is not true in every monastery). But at least in the Soto world of the US, rōshi is often used to signify a specific rank. Some people insist on it the way that an insecure college professor might trip up every introduction by always saying, “Actually, it’s Dr. Smithson.” I think most people find that kind of insistence off-putting, but to be fair, at least “Dr.” is a technical title, one earned in clear and measurable ways. Rōshi and sensei cannot be earned — they can only be given. 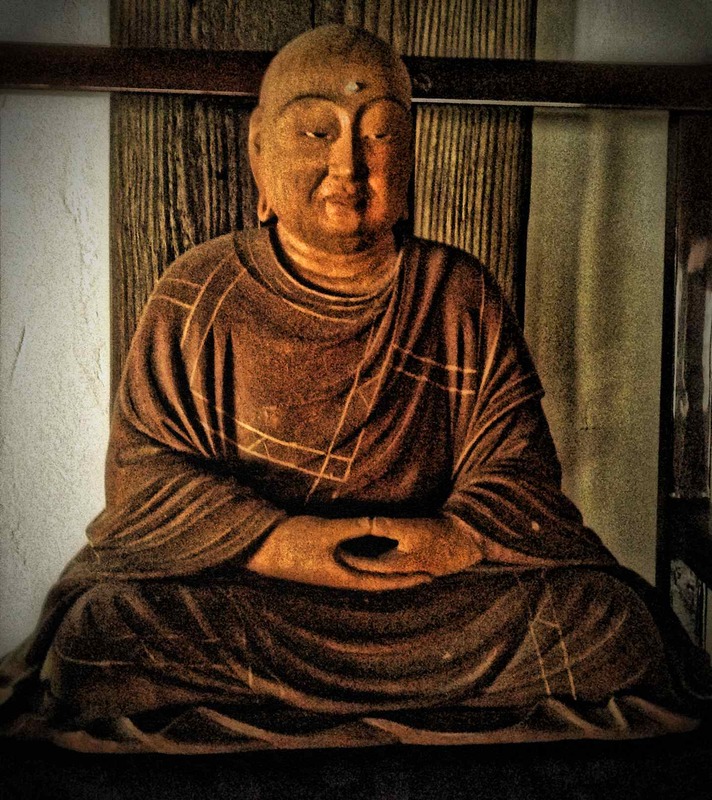 I’ve met novices who spoke openly of their goal to be a Zen teacher. That’s a serious mistake. That’s something that comes to us, not something we seek. There’s another phenomenon in the West in which students refer to their teacher not as “Smith-roshi” or “Jones-roshi,” but simply as “Roshi,” with a capital ‘R.’ I can see how that might become a default in a given community, among common disciples of the same person (though it rings very strange in my ear, even then). But to refer to your teacher as “Roshi” when speaking to someone outside of the group reveals a kind of arrogance, a worldview in which only one person in the world deserves such a title. I want to advocate for us, as westerners, treating these titles as people in Japan do. But I want to be clear: the Japanese approach to this issue is not superior because it’s Japanese, or even because it’s traditional. It’s superior because it’s more respectful — of priests, of the relationships we have with priests, of the relationships we priests have with others, of the living dynamic that is always in play between teacher and student, guest and host. We say in this tradition that the student makes the teacher; we even go so far as to say that when the teacher confers transmission on the student, the student simultaneously confers transmission on the teacher. We are mutually self-actualizing. A teacher does not exist in a vacuum; a teacher appears at the moment that a student does. I became a father when my son was born, not before. That seems so obvious, yet we have people with no students calling themselves Zen teachers, or even Zen masters. The complement to “teacher” is “student”; the complement to “master” is “disciple.” Whatever language you use, if you don’t have both, you have neither. Zen master, then, is a technical term, nothing more — perfectly appropriate for someone who has disciples, and embarrassing for someone who does not. Rōshi and sensei are not technical terms, but like teacher or master, their power comes from a relationship with someone else. If someone calls me sensei, that person is taking a step forward, asking me to be that role. When I address an older priest as rōshi, it’s the same thing — it’s me consciously conveying, “I want to relate to you as someone who is learning.” In Soto Zen, so much of the burden is on the student; this is just one simple example. So these terms are useful, even important. I would like some teachers to stop using them to describe themselves, but I would also like to encourage those teachers who shy away from such terms to stop resisting, to allow the people around them to take that brave step. Making that space for others, regardless of your own discomfort, is a profoundly generous act. In my experience of this tradition, generally speaking, priests default to humility. When a priest writes a letter, the smallest print on the page is his own name; it’s the same on the return address. When priests introduce themselves, they mention either their teacher’s temple or their own, but they do not say that the temple is big or small, nor do they refer to their own rank in the institution of Soto-shu. They don’t say how many disciples they have, and the more famous and respected their teacher is, the less likely they are to actually refer to that teacher by name. If these things have any relevance, they reveal themselves naturally. If not, then who cares? At the same time, when someone comes to me as a priest, I understand that I am being asked to serve in a particular function, to stand in that position (I wrote about this a few months ago over at Wild Fox Zen). In that circumstance, in that kind of relationship, Koun is not the point — the role is the point. In a very real way, the robe is the point. And though they’re not separate, they’re also not one and the same. (My karate teacher used to remind us, “I’m friendly, but I’m not your friend.” He’s the teacher; we’re the students. The price of admission to that relationship is the forfeiture of other kinds of relationships. And when it’s worth it, it’s really worth it.) When a priest is called upon to sit on the high seat, to expound the Dharma or confer the precepts, then it is the priest’s job to sit there without apology, without hesitation, and to become that function, to bring all the stillness or thunder to that role that he or she can. That’s our part of the contract, to say yes and yes and yes, to let go of showing who we think we are, and instead to offer ourselves as a mirror for others, to rise to that occasion, that expectation, that moment. But it’s also the priest’s job, when it’s over, to get down from that seat and to let that moment be over, to let the role be defined by whatever comes next, not by what just happened. What I can do is offer everything I have; what I cannot do is tell you how to feel about it, or how to label it. My actions and my words should point to the Dharma, not to myself. If my actions are words on a page, people should have to squint to see my name at all. If you’ve ever been to Japan and visited temples here – especially the more famous ones – you were probably impressed by the scale. Dharma Halls, especially, tend to have incredibly high ceilings, but the room is basically empty; you might find yourself looking for the beams, trying to figure out how it stays standing. 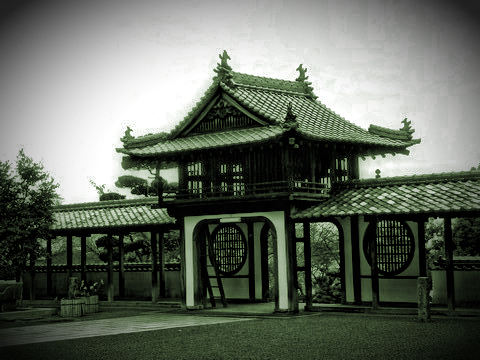 The Dharma Halls of Eiheiji or Sōjiji, when no one is around, can feel like empty stadiums, or really ornate airplane hangars. It can all seem a bit excessive. But if you were to visit those same rooms in the morning, during chōka (朝課, morning service), you might have trouble finding a place to sit among the 200-plus monks in training, temple officers, and visitors. It’s not wasted space. I haven’t written too much about the technical side of nyohō, in spite of the name of this blog. One of the more difficult aspects to describe, for me, has to do with space, so I thought I’d start there. We say that there are three faces of nyohō: food, clothing, and shelter. In adhering to these teachings, we look at three aspects: materials used, color, and size (or amount). So on a purely technical level, there are nine discussions to be had: food in terms of ingredients, color, and amount; clothing in terms of cloth, color, and size; and housing in terms of materials, color, and proportionate space. From the point of view of the tradition, “housing” refers to the sōdō, or monks’ hall, where monks do zazen, eat, and sleep. It expands outward from there to include the whole temple (which, if it’s a monastery, is also referred to as a sōdō). But that’s just a starting point, a useful reference to something measurable. The point is to apply these teachings to the space we’re in, to our homes, to our own location. How do we determine the “correct” size of something? This is not about big or small. It’s about finding what is just right. We see this idea most clearly in ōryōki, the bowls traditionally used in temples for formal meals (行鉢, gyōhatsu). The ō in ōryōki (応) means “appropriate”; the ryō (量) is “amount.” When servers come with rice and soup and vegetables, we hold out our bowls and signal when we’ve received just what we need. If you’re not hungry, you need not take a lot; if you’re a big eater, you can ask the server to fill the bowl, then to fill it again later on. One of my teachers is fond of pointing out that in the Zen world, equality doesn’t mean that everyone gets the same thing – it means everyone gets what they need, no more or less. 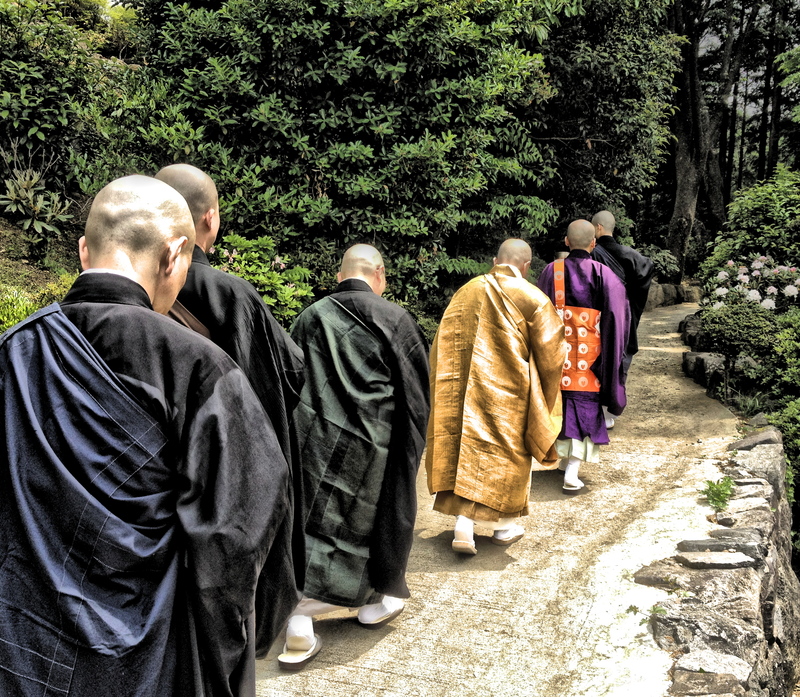 D, E, F, and G are the jō, where monks sleep, do zazen, and eat (in this case, five monks side by side). Each space is about 3’ x 6’, big enough (barely) even for me. (Bedding and personal possessions are kept in a short cubby called a kanki (N). But what I want to point out is the space in between the jō, marked by ‘O’ and arrows. Most of the time, nothing happens there, but there are ceremonies in which people get down from the jō and do prostrations, facing one another. 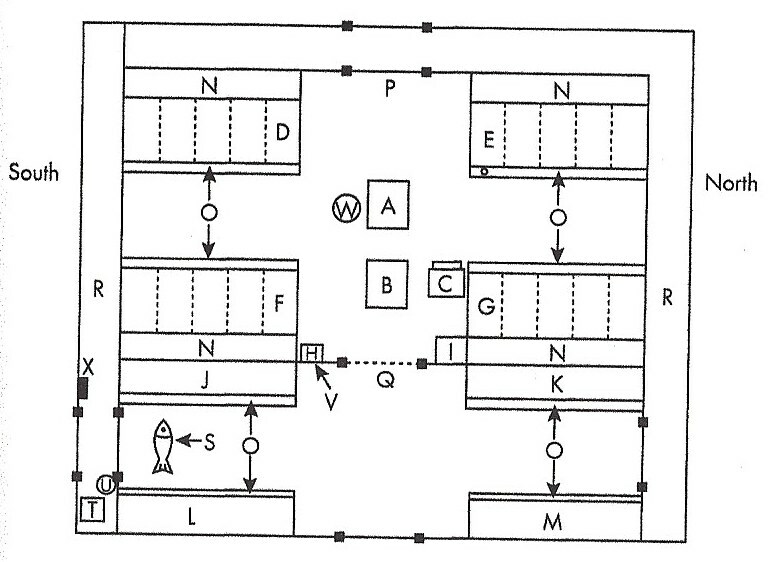 So this space is measured in terms of that function – it has to accommodate two average-sized people bowing, foreheads to the ground, without bumping into one another. That much space, and no more (because in the nyohō world, nothing goes to waste). This is one side of nyohō, an important one. We establish, physically, an atmosphere of practice, a place of encouragement. We orient ourselves toward the practice, but we also create spaces which are themselves oriented in the same way. This is not magical; it’s not feng shui. It’s something felt. It’s an opportunity to look beyond our own preferences and allow what looks mundane to be an integral part of our own intentions. That’s one side. But another is that we are where we are. Wherever you are, wherever you’re reading this, that is your place of practice. Space is determined by function, but function is also determined by space – if a sōdō is not built with a particular ceremony in mind, then that ceremony has to change. This is your location, and in this moment, the question of how you arrived here is irrelevant. It’s what you do now, what you’re doing now. There’s an incredible generosity in trying to put a teaching like nyohō into practice, in shaping that space for others. But there’s an equally great humility – and power – in using the space you’ve been given. Traditional Zen training, in so many ways, is an exercise in putting ourselves in smaller and smaller boxes, in closing the walls in around us. In a monastery, we literally give up our idea of what is “mine,” but even if we’re sitting at home, we do zazen according to a prescribed form. We accept those boundaries. We don’t move. It’s my experience that when we make the box so small that it seems we can’t move at all, when we choose that, the box ceases to be a box, and the world around us opens up into a vast field, open sky, ocean in all directions. Do you feel constricted, right now, in your life? Where are your walls? What, for you, is your function? How do you make that the function of where you are, in this moment? How do you measure your world? Please pick something up and hold it in your hand — a pencil, a coffee cup, your keys, whatever is nearby. If you’re reading this on your phone, then just for a moment, allow your attention to shift away from the words on the page, and towards the act of grasping the machine in your hand, the sensation of it, the weight. Even just this — paying attention to the sensation of ordinary activity, noticing that we are always touching something — is something we do very rarely. Put the object down. Now pick it up again, but with two hands. Hold it with two hands. Feel that. Notice how using both hands changes your posture just a little, how it makes this simple gesture so much more deliberate, so much more careful. So much more generous. Notice how, especially if it’s a small object, using two hands allows you to treat it with so much more care. You hold a coffee mug the way you might hold a kitten. With two hands, you don’t just grip a pencil — you hold it with your fingers, as you would something breakable. This is something we almost never do, not unless we choose it. This simple choice is one face of what is called hōrei (法礼). The hō is Dharma. The rei in this case refers to a kind of etiquette, so in my head, I tend to translate hōrei as “Dharma decorum.” But the rei also means “gratitude.” We should keep that in mind. Hōrei applies to human interaction, of course — how we serve a guest, how we approach a teacher, how we receive a gift, and so on. But on a more basic level, it speaks to how we treat the world, how we stand as both host and guest in each moment. In a monastery, there are almost endlessly specific physical instructions, for how to stand from a seated position (using your index and middle fingers as support, if there is a table in front of you), how to brush one’s teeth (with the right hand, left hand covering the mouth), how to enter certain spaces (from the left side of the entrance, left foot first), and on and on — and those are just a few that don’t require synchronizing with the movements of those around you (there are many, and they get complicated). All of these can be considered expressions of this etiquette, and they can take years to learn, and even more years to really integrate in a natural way. But the most basic principle of hōrei can be expressed very simply: use both hands. Whatever you are doing, whenever possible, use two hands. If you are opening a door, open it with two hands. If you are shaking someone’s hand, use both hands. Even when it seems like overkill — like picking up a fork at the start of a meal — use two hands. Like so many aspects of Zen practice, this may seem silly or useless or like a waste of time, but if you really apply this, it will change the way you approach your life. Holding a coffee cup with both hands is holding a coffee cup one hundred percent. Nothing is withheld. The action is given full value. If you are drinking coffee with a friend, try it both ways: drinking one-handed, then holding the cup with both hands. When we drink with one hand — the normal way — we do nothing with the other hand, or we use it to gesture, or perhaps we even use it to prepare our next bite of something. That is to say, we multitask, and in doing so, we do not commit to any one thing. Every action is partial. Zen practice, as I understand it, is total commitment — to this action, to this moment, to this encounter. Drinking coffee with one hand is not total commitment to that action. There is something we are holding back, something we are keeping for ourselves. When I type on this keyboard, I touch the keyboard; my legs touch the chair; my feet touch the floor. If someone were to ask me what I’m doing, I might say, “I’m writing,” but that does not begin to cover it. There’s an intimacy in action, all the time. When I get stuck on an idea, I put my hands on my face and read the words on the screen. When I stop mid-sentence, unsure how best to proceed, I squeeze the carpet with my toes. I take great joy from this blog, from the comments that come, from that dialogue. It feels like communication, like a reaching out. But right here, in this room, in this city, far from anyone who reads these words, there is a world of contact. How I touch the world of this room is how I touch the world. In concrete terms, it’s all I can do — it’s all I’m doing. There are teachings that we should treat books with reverence, never placing them on the floor, always holding them just so, because the preserved word is such a precious gift, a link to the world of the writer. But there is a simpler way of looking at it: we treat a book with reverence because it is the thing in front of us. We hold it with two hands because we use both hands to receive a gift, and because we use both hands to make an offering. We hold it gently because this action is the culmination of all of our actions, all of our thoughts, all of our experiences. I drink a glass of water with two hands because that’s drinking with my whole body, and that’s drinking with my whole life. I open the door with two hands because I only have two hands. I once heard a Tibetan teacher say something like, “You should drink coffee with the same intensity as if you’re being chased by three tigers.” In Zen, we might change that to say, “Drink your coffee as if your head were on fire.” And in Soto Zen, we might simply lean forward and pick up the coffee mug with two hands, cupping it in our palms. It’s not so much that your life depends on it, but that this is your whole life. Yesterday at Sweeping Zen, Adam Tebbe posted a video of Jun Po Denis Kelly, head of the Hollow Bones Order and the creator of Mondo Zen™, laughing about a sesshin in which he “terrified” a whiny participant by grabbing him by the chest, throwing him against a wall, and growling, “Wake up. People are dying.” Jun Po uses this as an illustration of the “ferocity” of Rinzai Zen, and ends by saying that though that ferocity needs to be maintained, it also has to be used skillfully. Adam’s question was, Does this kind of violence have a place in Zen? There’s a lot to be said about it — I understand the concern, but I do think there’s a place for a kind of ferocity, an intensity, even if we don’t often see it in the Soto world. So I’ve been trying to sort out my thoughts about it, but I’m finding that it’s hard to separate out the question at hand from the fact that I feel predisposed to distrust Jun Po Denis Kelly. I have never met him. I like his photographs — he has a powerful look about him. And his resume is pretty great — he’s worked hard to be where he is, and I don’t doubt at all that a deep sincerity has been behind that work. I would say that he comes off as arrogant in the video, but that aside, I actually like that he seems to take a hardline, my-way-or-the-highway view of training. That can be a good thing, assuming other factors are in place. So this distrust I feel may be completely unreasonable; the reason may be too simple to be legitimate. But here it is: it’s the little ‘ ™ ‘ after Mondo Zen™. Mondo Zen™ is based on Japanese and Chinese Zen, updated for the 21st Century. Mondo Zen™ transcends the hierarchical/authoritarian, gender-biased and constraining monastic aspects of traditional Zen in favor of practical, experiential “in the world” engagement. Relying only on direct personal experience – as taught by the Buddha himself – it does not allow mythic constructs to complicate its philosophical orientation. This includes ideas such as reincarnation, soul as personality, bardo realms, past lives, a creator deity, or other faith-based beliefs. It is important that in our practice of Mondo Zen™ we consciously choose to set aside all such ideas at least until we have experienced, tested and evaluated for ourselves a simpler and stronger way of knowing. Why is this important? Because those beliefs and concepts force our immediate experience into a container of pre-defined understanding, robbing us of the experience of deeper insight. By letting go of our attachment to our beliefs and mythologies, at least while we are actively doing this practice, we remove a barrier to insight caused by our attachment to those views. It keeps going: Mondo Zen™ is “a transmission of Correct Understanding,” “a full heart-mind collaboration between ‘student’ and ‘teacher,'” and so on. I have trained exclusively in traditional Japanese monasteries, and I would describe Zen in the same way. Of course Zen relies on direct personal experience. Of course it does not allow mythic constructs to complicate its philosophical orientation (though I would add that it also doesn’t allow its philosophical orientation to complicate its philosophical orientation!). Of course it transcends the hierarchical, gender-biased and constraining monastic aspects of traditional Zen — it transcends all containers, and fills them too. This is a strawman argument. This is packaging the obvious as something revolutionary. There is no “update” to be found here. If anything, this stinks of Boomeritis, the term coined by Ken Wilber (a brilliant philosopher, and colleague of Jun Po’s) to describe baby boomers’ inclination to believe that they are the first ones to see things as they really are, and that they will be the ones to establish the new paradigm. In short, this is just cynical marketing. And though I understand it, I think it’s a crime. The more famous example of the ‘ ™ ‘ is Genpo Merzel’s Big Mind Process™ (“Big Mind®: The gateless gate to boundless perception”). In some ways, Genpo is too easy a target. His activities had been the object of private derision by Zen teachers for years, then last year, after various scandals were made public, he became an object of public scorn. Much was made of his indiscretions, and along the way, some critics also laid into Big Mind Process™ itself, mostly labeling it a scam, something with no connection to Zen. But in its marketing, Ken Wilber referred to it as “arguably the most important and original discovery in the last two centuries of Buddhism. …With the Big Mind Process, a genuine kenso can occur in about an hour — seriously.” It was called “the third turning of the wheel of the Dharma.” In reality, it’s Voice Dialogue repackaged for a Buddhist audience. And as a tool of inquiry, I have no problem with it; like many others, I am, however, uncomfortable with the over-the-top claims made about it (among other things, if realization is just an experience in your brain, that’s a reductive re-definition of realization). To be fair, in one important way, Mondo Zen™ and Big Mind Process™ are not really in the same category. Mondo Zen™ describes Zen exactly the way just about everyone would describe Zen, then claims that it’s new and improved. Big Mind Process™ takes something that has almost no relationship to any historical understanding of Zen, then says that Zen has evolved into this. Both arise from the assumption — always confusing to me — that Zen and Buddhism are somehow fundamentally irrelevant to “ordinary life,” that they’re broken and have been waiting for someone to come along and make them meaningful again. But each is trying to sell something very different from the other. Both, I suspect, offer something fairly valuable. I’ve watched videos of Big Mind™ workshops — it looks like a nice therapeutic tool, one that many could benefit from. And I suspect I would like Mondo Zen™, because it appears to be exactly like, well, Zen. But it’s this “selling” that does not sit well with me. I want to be perfectly clear: I have no problem with Zen priests trying to make money. A lot of people, in my experience, take a puritanical view that priests should live in poverty, and they begrudge them any income at all. But the fact is that in most cases, even the famous ones live with very little, and the obscure ones barely scrape by. I’m sure Genpo Merzel has a comfortable personal income, but I also know that much of the income generated by his work has gone to support his center. Brad Warner has been very forthcoming about how little he makes from selling so many books, and I have no reason not to believe him. Zen priests struggle. In Alaska, the members of the center, for all their sincere efforts, couldn’t completely support me on their own, so I took another job — that job, in very real ways, was what made much of the activity at the center possible, because that non-priest job gave me the basic security to stay in Anchorage and do my work as a priest. That scenario is playing itself out all over the country, at centers big and small. I know priests who want to retire but can’t, because they know that shaking things up in even the slightest way will cause the center to collapse completely, and they don’t want that to happen. I know another priest who has worked for years as an airline attendant — his community would benefit tremendously if he could be with them all the time, but who will support that? So when a priest takes on another job, or when they get second billing on the yoga retreat circuit, or when they pursue book deals, I think, congratulations. When Zen centers make the decision to flat-out charge for events instead of sticking to a donations-only policy, I sympathize — I’ve been part of those conversations, and those decisions are never, never easy. They’re painful. It’s never about money, never just that, not as an end in itself. It’s about creatively supporting a place of practice and your own work as a priest when, in this culture and in this economy, others can’t or won’t. There are rich, fat-cat Zen priests, but not in the US, not as far as I know. So if Jun Po and Genpo have money coming in, that’s fine. If it’s because they’re creative, forward-thinking teachers, that’s fine. If it’s even just charisma, that’s fine. I’m not concerned about teachers being successful on that level. In any case, that kind of success is rare. However, both Jun Po and Genpo are making claims that they have discovered a revolutionary way of sharing the Dharma, one that is uniquely suited to our time and our culture, one that offers a kind of insight and authenticity that is otherwise not available. Then they’re trademarking it so that no one else can steal it. It’s so completely out of place in a tradition like this one that when you first hear about something like this, I think the normal response is not outrage but incredulity. You’re kidding, right? The Dharma, to me, is the sun. It shines on everyone equally — it is always ever-present, always available. For centuries, we’ve turned to teachers to help us to see that light, to feel that heat on our faces directly. to realize that it was always there. Some teachers are amazing in that role; others are not. Some in our history have been innovators, while others have taken a more conservative approach. Some have taken on that role gladly, with a confidence that can be both powerful and unsettling; others have tried their best to remain invisible. But in 2500 years of teachers, how many have said, “I have found the better way to introduce others to their own true nature, to guide them to true seeing, to awaken them to limitless experience. And no one is allowed to teach this way but me”? Before the turn of this century, I suspect that the number was zero. Buddhist teaching is a deep sea of plagiarism. Teachers shouldn’t pass off another teacher’s words as their own — that kind of direct stealing benefits no one. But the reality is that if we immerse ourselves in these teachings, if we listen to others with an open heart, if we chew on something we heard for months and years, we lose track, not only of who first said what, but of the more basic question of whether the ideas in our heads are really ours at all. I have thought, “This is the perfect analogy to describe such-and-such,” and thought I was really clever, only to find that the analogy appears in a book I read fifteen years ago. It was just worming its way into my head all that time. I’ve also come up with things that felt like something I’d heard, but after years of reflection have decided, no, that really is my own phrasing, my own illustration of that point. It has to be this way, because we have to bring everything to the table every time. If I love the way my teacher teaches, I will try with every bone in my body to embody that way of teaching. I can’t help but make it my own, but when I sit in the role of teacher, my teacher is also teaching, and so is his, and so are the authors of my favorite books, and so on. “My” style is born of something borrowed, stolen, absorbed, imitated. None of this is mine. It’s not mine to withhold. It’s not mine to begrudge. And it’s not mine to trademark. Entering a traditional Zen monastery is a strange thing. Let’s say you enter on a Tuesday. You arrive at the gate in your full robes, arranged for traveling — skirts slightly hiked up for mobility, sleeves tied back, white covers on your shins and forearms. On your head, a wide bamboo hat that nearly obscures your face; on your feet, rough, straw sandals that (if you’re not used to them, and few people are) cut into your skin. On this Tuesday, you stand at the gate and wait. And wait. After a while, a monk comes out to greet you. He bows and asks what you want. You say something obvious, something sincere, but you can see on his face that it’s not the right thing. This scene repeats, and you’re finally let in after an hour, or two, or ten. And from that moment forward, you are a monk, living the schedule of a monk, meditation morning and night, chanting, eating in the same ritualized way that monks have for centuries, wearing these clothes, using these bowls, saying these words, walking just so. Standing just so. Sitting just so. But on Monday, this was not your life. You ate what you wanted for breakfast, maybe while watching TV, or talking with a friend on the phone. You went where you wanted, when you wanted, and when you walked, you didn’t give it much thought. The thought “How should I stand?” didn’t cross your mind. Maybe you spent the day in pajamas. So it’s natural that many monks, even after training for weeks or months, can wonder if perhaps they’re just play-acting. After all, so much of monastic life is choreographed — in ceremonies, this bell signals this person to enter, which then becomes the signal for another person to follow, and so on. There are even rehearsals. Monks — many, in my experience — will speak of a moment (or moments) of looking around at everyone so earnestly putting on the show, and thinking, “Really? Aren’t we just pretending to be something that no longer really exists?” I asked myself this question, more than once. I’ve heard from many people who knew him that Miyazaki-zenji, former abbot of Eiheiji (until his death a few years ago, at age 106), had an easy solution for those monks doubting their own authenticity: fake it. Don’t worry about being the real thing — instead, imitate a “real” monk. Stand like a real monk stands. Walk like a real monk walks. Do zazen just like a real monk. And repeat. “Imitate, imitate, imitate—imitate for your whole life.” That’s the real thing. It might at first sound like a flip response to a sincere question, but actually, this is a radical and direct explanation of Zen practice, a face of it which is easily misunderstood. As one of my teachers is fond of asking, “How does one imitate a thief?” By stealing. What defines a thief? That very same act. It reveals our most basic concerns as human beings that even when immersed in the world of Buddhism — a body of teachings which unequivocally rejects the idea of a substantial, lasting, unchanging self — we become trapped by this question of authenticity. “Yes, I’m bowing just as I was told to, but am I not just pretending?” On one level, perhaps, sure. But in that case, what you’re calling “pretend” has exactly the same ingredients as what is “real.” One might even argue that what makes your actions inauthentic, if they are inauthentic, is this need to define their quality, this insistence on trying to view and evaluate them from a distance. We all know someone who baldly separates what they do from their understanding of who they are. Someone who plays piano every day might insist, “I’m not a pianist.” Why? Perhaps in that person’s definition of pianist, some particular skill level is required. Or maybe public performances make a true pianist, or formal training, or a certain number of years of experience. But when that person’s fingers press down on the keys, that’s piano playing. Whether that’s a pianist or an imitation of a pianist is a question designed to take us out of that action into dissociation, where our actions are not defined by themselves, but by what we think of them. “Pianist” is a story; “playing piano” is real. Looking from another angle, it is not difficult to find someone who, in spite of being consistently unkind, insists that he’s a very kind person. Who I think I am is not much more than a dream I keep having. If I am any one thing, it is this one thing that I am doing right now. If I give in this moment, I don’t have to worry about whether I am a generous person or not. If I trust in this moment, then the question of whether or not I am a trusting person is absurd. I am only my story to the extent that my story is limiting my ability to genuinely act. And this is not just about how we view ourselves. We are also quick to judge others, to call them “false” or “two-faced” when they act in a way that we know does not come naturally for them. We say they’re posers. Traditionally, the world of Zen is a profoundly formal one, one in which a very refined etiquette dictates almost any encounter. That kind of interaction comes naturally to exactly no one — it’s something we choose, something we make real because we feel it has value, because it has the taste of generosity. It’s an attempt to offer a gift, to cultivate an atmosphere which we feel offers benefit. But when we see someone making an effort to be polite at that level, we too easily label it as a performance, a deception. We say they’re putting on airs. We miss what is right in front of us, which is that the person who is acting polite is also simply being polite. What is it to be honest in one’s actions? If I act in a particular way to get something from you, or if I put on a particular persona specifically to deceive you, that’s dishonest. That seems clear. But what if I’m just trying to change the way I touch the world? I used to walk with my toes pointed out at an angle — my mom told me I walked like a duck. It drove her crazy. She tried for years to get me to change my walk, to fix me, but I said, No, this is who I am. This, I thought, is the honest me. Then, in fifth or sixth grade, I checked out a book from my school library called How to Be an Indian. By any modern standard, it was a horrible, racially misguided book. It even included recipes for face paint — not for decorative face paint, but for paint to make your face the color of a Native American. I can’t find any trace of it online, and that’s good. But for all its failings, at least to a ten-year-old, the book depicted Native Americans as noble, skillful, resourceful people, people one might like to emulate. One page was about how to walk — it said that “Indians are so quiet in the forest” because they walk with their toes straight forward, not at an angle. I liked that. I wanted to be like that. So I started trying to walk that way. It took conscious effort at the start, and I’d often forget. But over time it became natural, and now, thirty years later, that’s still how I walk. Am I pretending to be something I’m not? Was I even pretending then? Or was I simply making a choice about how I want to move in the world? Was it ever a lie? If so, I can’t see it. People value honesty. I do too. But in order to understand what honesty is, we need to clear our eyes a little and look very carefully at what constitutes a lie. I have to let go of who “I” am. I need to let go of who “you” are — I need to give you permission not only to embrace who you want to be, but also to be clumsy and unskillful in getting there. I need, at the least, to imitate someone with that kind of generosity. That’s enough.